Juba — President Omar Al Bashir has called for the opening of all crossings between Sudan and South Sudan, with the start of the resumption of river transport from Kosti to Juba, while arrangements are being made for a summit between the Sudanese president and Salva Kiir in South Sudan's capital. On Sunday, South Sudan's Presidential Advisor Tut Galwak conveyed an oral message to President Al Bashir from his Sudanese counterpart, Salva Kiir, on the situation in Sudan and the relationship between the two countries. During the meeting, he briefed President Al Bashir on arrangements made in the peace process and the security situation in South Sudan, stressing that both leaders are confident that the two countries can develop bilateral relations. According to the advisor, arrangements are underway to hold a meeting between Kiir and Al Bashir in Juba soon. In a press statement following his meeting with al-Bashir, Galwak said that his message was meant to underscore the South Sudanese government and people's support of President Al Bashir "against conspiracies and foreign intervention". 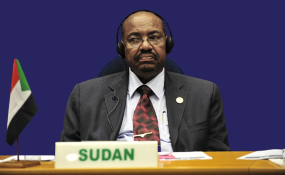 He added that South Sudan is an integral part of Sudan and they are one family. Galwak added the joint cooperation on oil is progressing well to benefit the economies of both nations. He said work in the oil fields is at an optimum point for revival of the economy of both countries. On 26 March 2019, people in Sudan's West Kordofan and South Sudan reported that the closure of crossings and the collapse of the South Sudanese currency have contributed to the worsening economic conditions in the region. A resident of Abyei pointed out that they are dependent on goods coming both capital cities of the two countries. At the level of security, residents pointed to the relative stability in the region following the signing of agreements between the Dinka and the Misseriya tribes on the resolution of settlements and the crossing of pastoralists across the border between the two countries. Abyei's rich oil reserves make the region economically desirable to both Sudan and South Sudan. The area is still contested. Resolving the status of the area is one of the essential steps the two countries need to take to ensure long-term peace in the region.